Though women in Pakistan enjoy slightly greater freedoms than those in some Muslim countries, the societal deficiencies women continue to suffer are glaring. Women in Pakistan are typically considered subordinate to men, despite attempts by the government and activists to elevate the status of women. 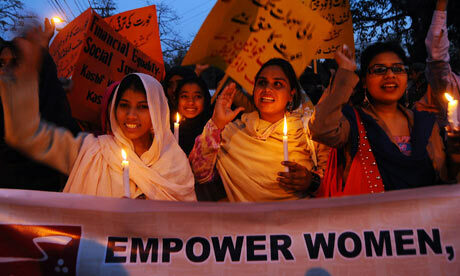 In 2012, Pakistan was named by the World Economic Forum as one of the top worst countries in terms of gender gaps. Women in Pakistan endure various abuses, including sexual violence, dowry deaths, domestic violence, acid burning, honor killings, forced marriages, forced prostitution, and human trafficking. Among officials, however, attitudes can be skeptical or biased in response to complaints -- often leading to the mishandling of cases.